As one of the biggest young stars in baseball, Bryce Harper has been well known among sports fans for several years, but he’s gained a surprising following among the fashion minded as well. With thick hair that he reportedly spends time styling before ball games (despite the fact it’s usually covered by a hat or helmet), Bryce Harper’s edgy haircuts and fun, daring styles have made him the most trendsetting man in baseball, and maybe all of professional sports. 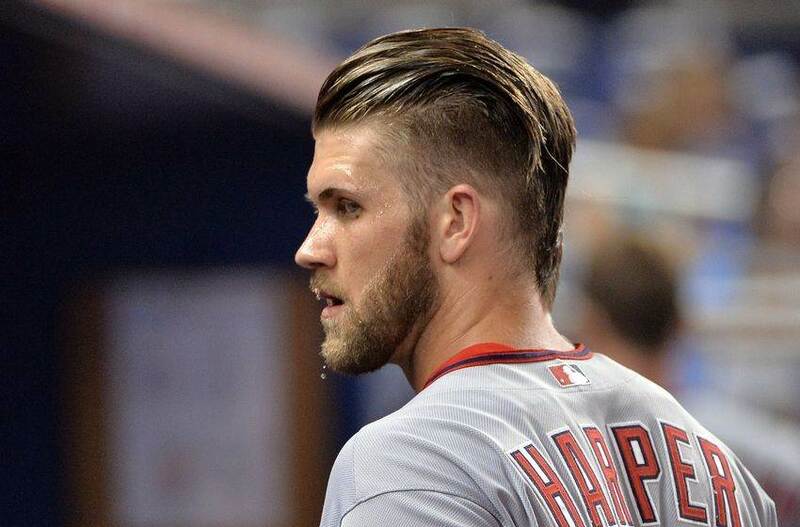 With an affinity for undercut styles with slicked back or high volume longer hair on top, Harper’s looks are often right on trend, and always interesting to look at. 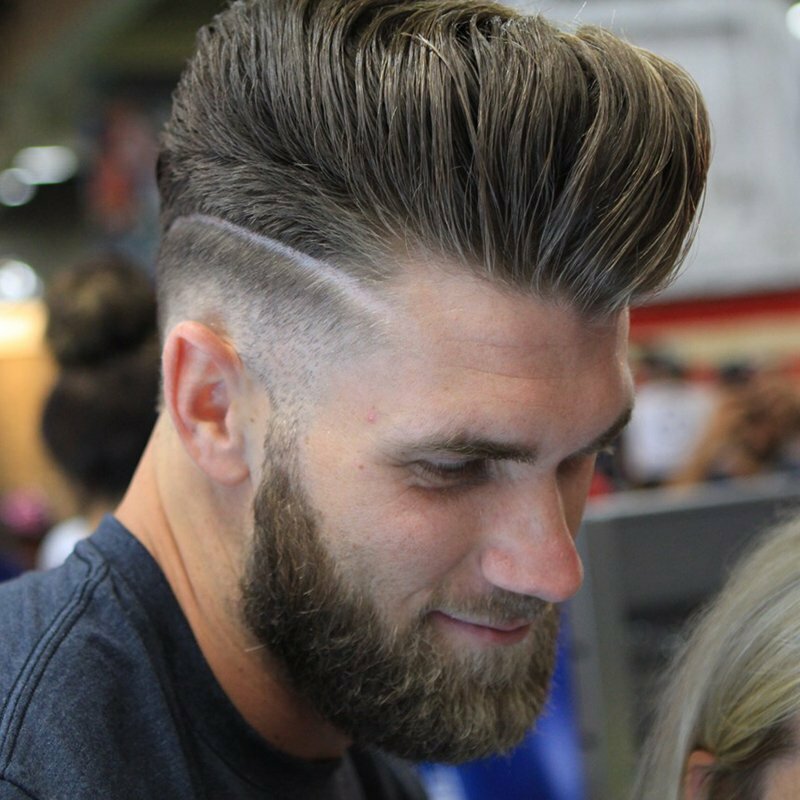 If you want to bring some All-Star style to your hair game, take a look at our 20 best Bryce Harper haircut looks. 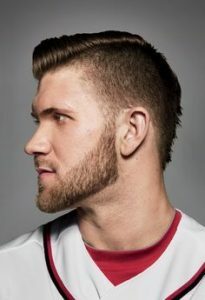 At first glance, this haircut might look like a typical undercut style with longer hair on top, but a section of longer hair runs all the way to the nape of the neck, creating a mohawk silhouette. More manageable than a classic mohawk, the length in this style tapers significantly from front to back, meaning you only need to worry about styling from the crown upwards. 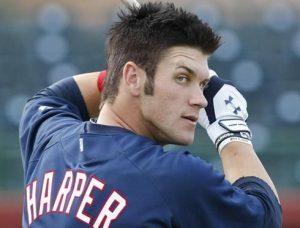 Go for a slicked back look like Bryce has done here, or try something like a quiff or pompadour for a special occasion. If you’re looking for one of Bryce Harper’s haircuts that’s fashionable without being too flashy, and is appropriate for professional settings, try this stylish look.The comb over is framed by a nicely defined part and styled with enough product to impressively stay put during the game, and unlike the edgier undercut looks, this style features sides that are shorter than the top but left long enough so that skin doesn’t show through. It doesn’t get much lighter than this! 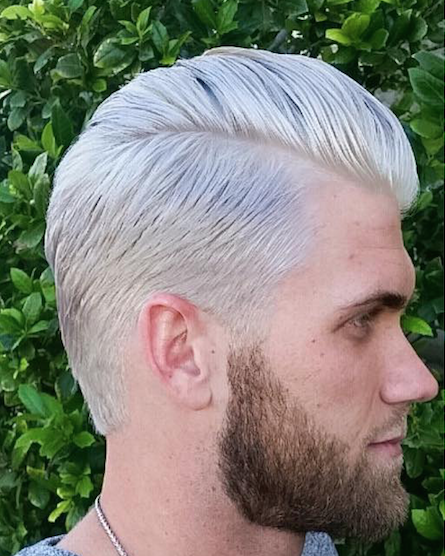 Harper stepped far away from his natural hair color with this ultra bright platinum shade. 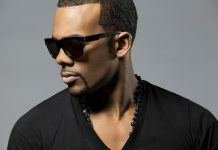 The haircut here is a fairly simple taper cut, styled in a basic slicked style to let the color be the standout star. If you’re planning on going this light, it’s a good idea to have your color done by a professional, as bleaching accidents can result in some truly regrettable shades of orange. 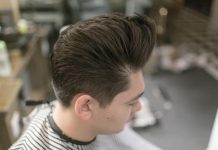 This high volume haircut is an example of a modern pompadour, with hair styled backwards and upwards. Keeping the sides in a short undercut helps to reduce styling time, especially if you’re trying to make your style stick all day long, or during intense physical activity. 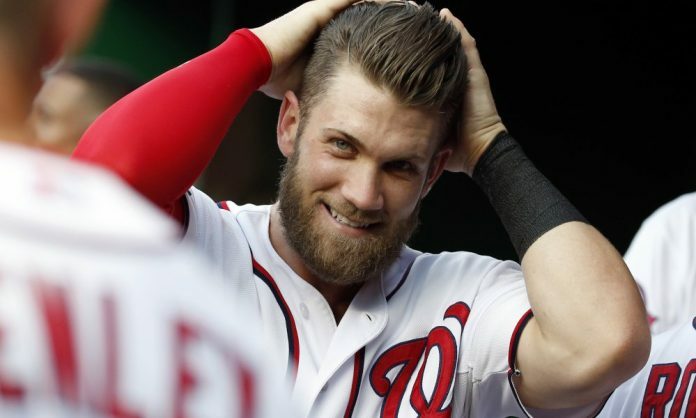 By styling the longer hair on top forward and then upward right at the hairline, this modern quiff cut is a little less retro looking than a pompadour. Using a volumizing mousse on damp hair will help hair achieve maximum height before you add definition with a wax or paste product. 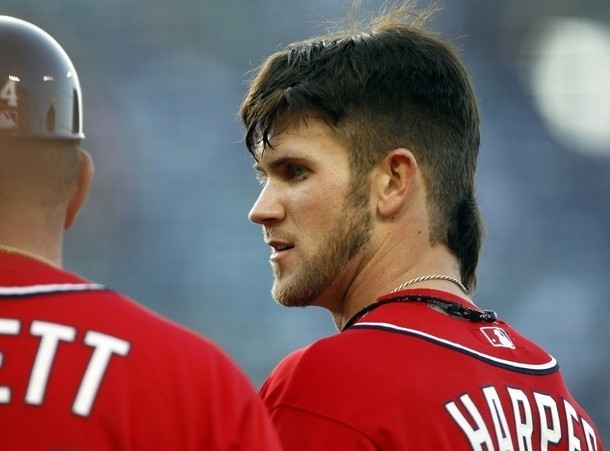 With this haircut, Bryce Harper went for super closely cut sides in a skin faded style. For guys with really thick hair, this technique helps to reduce bulkiness and keeps things looking clean around the ears and nape of the neck, allowing more time between trims. 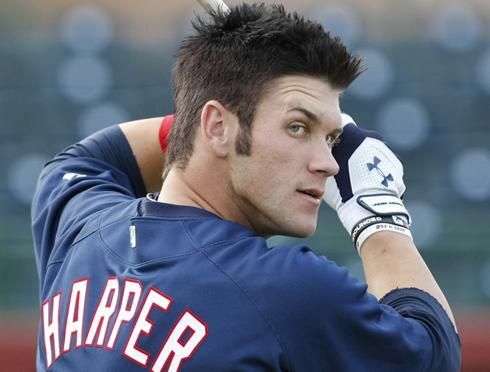 Harper’s hair is left longer on top as usual, and in a slicked back style that doesn’t require quite as much precision as a pompadour or quiff. Bryce Harper’s hair looks to have undergone some chemical lightening in this heartthrob style. We can see more notes of pale and golden blonde, but the overall look is still fairly natural, as he hasn’t moved too far away from the color he was born with. 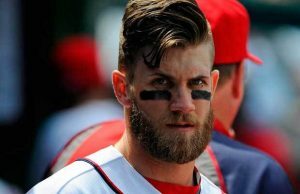 This haircut features a higher undercut, which makes it a good choice for thick haired men who want to cut down on their styling time. 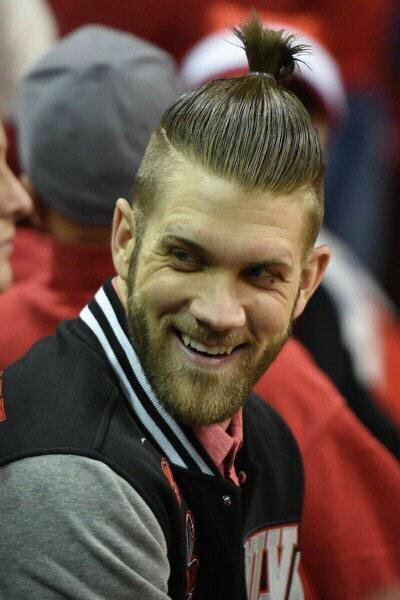 Longer hair on top is combed over, and is framed by the edge of the undercut instead of creating a defined part. 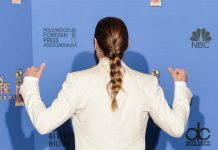 If you love undercut styles with much longer hair on top, the man bun can be a practical way to style hair for working out, travelling, or any time you’re short on styling time. To tame fly-aways and keep hair from looking frizzy, use a product like a smoothing or texturizing cream before you tie hair into place. 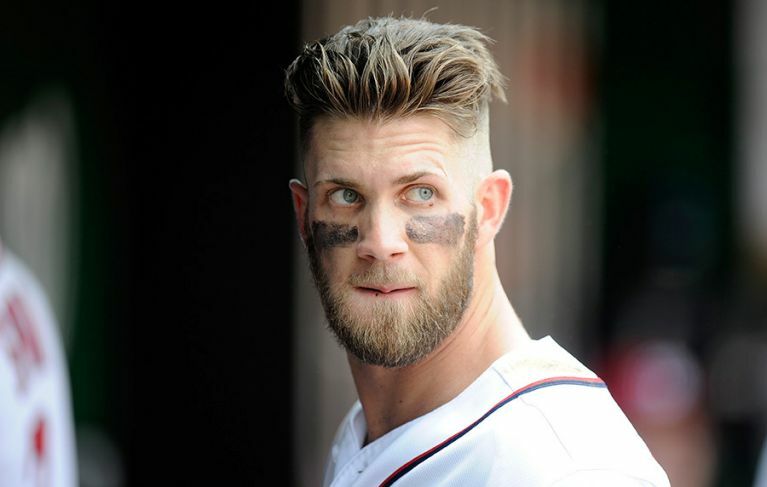 Gradually tapering in length from front to back and down the sides, this is a classic haircut that lends itself well to different types of styling, including a slicked back style as shown, or a softer parted style. With a super high undercut and longer hair that’s slicked into a comb over on top, this is an edgy haircut for men who are hoping to spend a minimal amount of time styling. 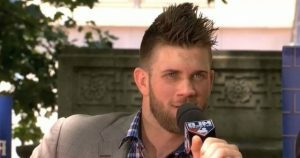 For added interest, this look features a strip of longer hair running down the back of the head that creates a subtle mohawk effect. 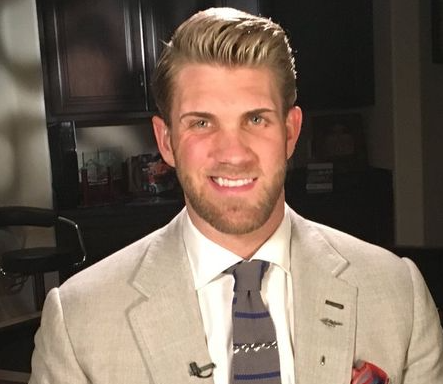 Another haircut from Harper’s lighter haired days, this blonde look is a basic taper cut that’s been left long enough on top to wear in spikes. 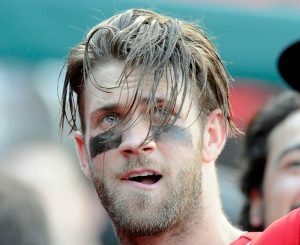 For thicker haired men like Bryce, a strong hold product like a gel or pomade will be needed to maintain this kind of height and definition. 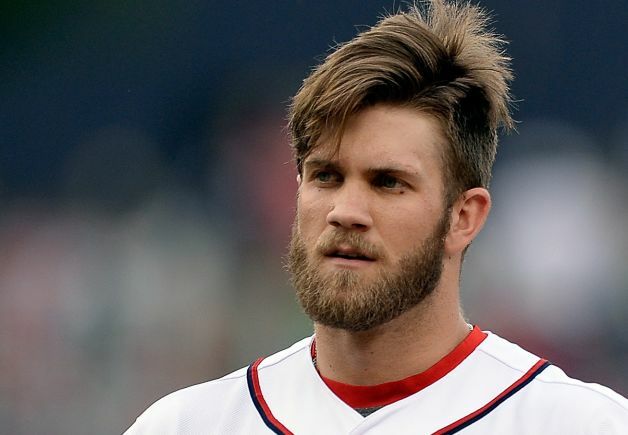 One of the more relaxed styles we’ve seen Harper wear, this long on top look is softly parted, and styled with minimal product rather than being slicked into place. 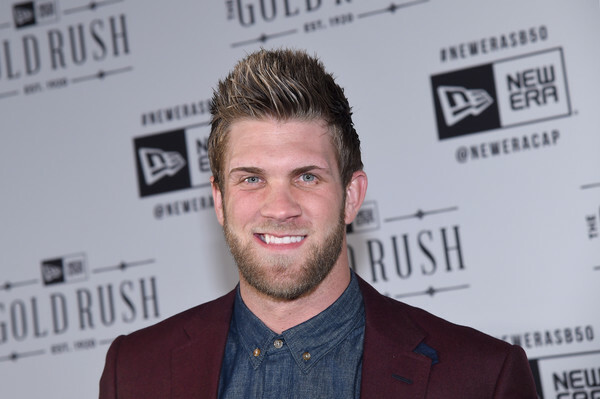 Tapered sides replace the ultra trendy undercut, making this a little more of a minimalist look. 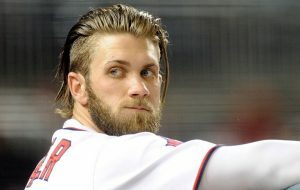 Channelling his inner Sons Of Anarchy style, this is one of the longest haircuts we’ve seen Bryce wear, extending about as far down as his jawline. 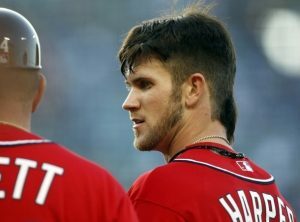 The undercut sides help things look trendy as well as being a huge time saver when it comes to styling. 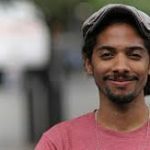 For men who are new to wearing their hair longer, it’s a good idea to start training your hair to be directed backwards instead of naturally falling into a part. 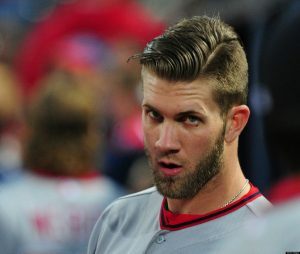 This earlier haircut from Bryce Harper looks like a fairly basic taper cut except for the patch of longer hair left at the nape of the neck. An unconventional style like this is easier to pull off in a career path where professional appearance isn’t as important, and it makes for a fun departure from the styles that every other guy is wearing. If you’re transitioning from longer hair to a short cut, you could try this style out for a fun in between period. Being in the middle of a baseball game probably has something to do with this messy style, but it makes for a nice change from the perfectly slicked back hair we’re used to seeing. Longer hair can feel like it takes more work to style, but it’s often easier to get away with a messy, tousled style when your strands are long enough that hair won’t stick straight up on its own. This sky-high spiky style depends on a strong, reliable product to keep in place. Try using a gel if you don’t mind a hard, shiny texture to your finished style, or use a wax if you’re after a more matte finish. 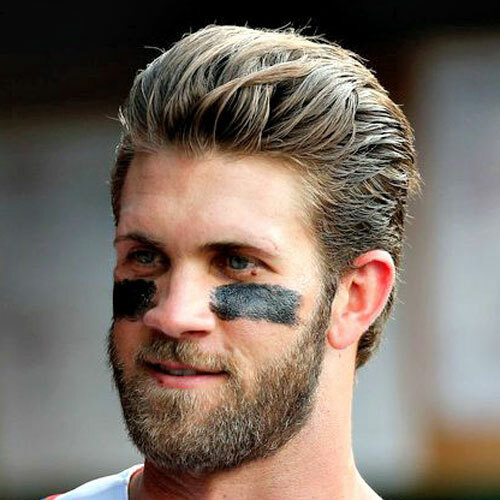 Although some men use oil based pomades for vintage-inspired styles, we’d recommend sticking to water based products, as they’re much easier to wash out when it’s time to start your styling routine over again. This skin faded style begins fairly high up, and is a great style option for men looking to slim the appearance of their faces. Hair on top is left longer and given a soft, tousled styling treatment that’s made easier when thick hair is cut with textured layers. 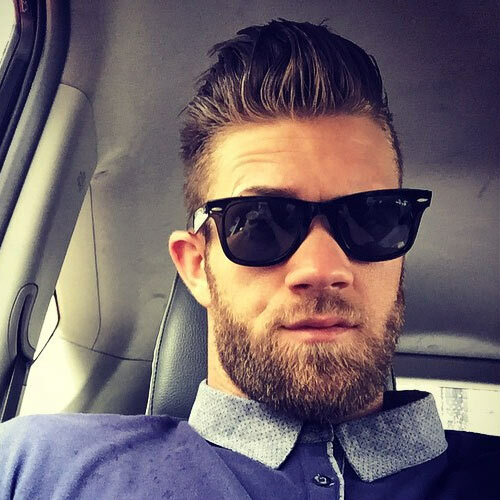 Before the legendary dirty blonde and sandy brown styles we see Bryce Harper wearing today, he was darker haired and fresher faced. This fairly classic taper cut looks ultra conservative compared to the closely shaved undercuts and high volume styles he’s since become so popular for wearing. 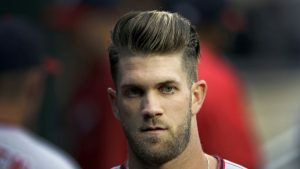 One of Harper’s most recent style incarnations, this impossibly high pompadour style is a massive styling feat that appears to defy gravity. If you’re hoping to recreate this style at home, having thicker hair like Bryce’s will make things much easier. Begin by working a mousse or other volumizing product through damp hair, then blow dry in an upward motion, working against the direction of your natural part if you have one. Once hair is dry, use a small amount of a paste or other tacky product to define the shape of your hair, being aware that adding too much can weigh it down. If you’re looking for a long lasting style, finish your hair off with a maximum hold hairspray.